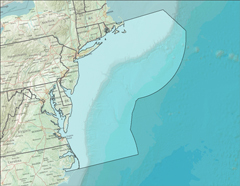 The Mid-Atlantic Coastal Ocean Observing System (MARACOOS) spans the coastal states from Cape Cod to Cape Hatteras. Coverage includes all of the estuaries and continental shelf waters within that coastal area. Map of the Mid-Atlantic Regional Association. A fundamental MARACOOS asset is the diverse expertise of its approximately 1/3 academic, 1/3 industry, and 1/3 non-profit/government membership. MARACOOS has developed a collaborative network of scientific, business, non-profit and government leaders who are dedicated to applying their combined expertise to address priority regional needs. Multiple federal agencies have recognized the combination of expertise, operational capabilities, and opportunities in the Mid-Atlantic with their investments in this region including NOAA, Department of Defense, National Science Foundation, Department of Homeland Security (including USCG), NASA, and the Environmental Protection Agency. An ensemble of both statistical and dynamical ocean forecast models that (a) assimilate spatial data from the satellites, the HF Radar network, and the fleet of autonomous ocean gliders, and (b) are forced by an ensemble of atmospheric models validated with the meteorological network.